The Battle of Hamich Ridge, 1st Battalion, 47th Infantry Regiment, 9th Inf. Div. Interview with Lt. Col, Jones D. Allgood, CO, 1st Bn., 47th Inf. The 1st Bn. was well up to strength and in fairly good physical condition at the commencement of this campaign. The battalion had been sitting in the woods near GRESSENICH (990425) for close to two months since the attacks to penetrate the Siegfried Line. Activity during these months had been confined to patrolling and several minor brushes with the enemy. For a brief period, approximately four days, the battalion had an opportunity to plan for the coming operation. cold, wet, and generally uncomfortable for the men throughout the campaign. For an extended period, prior to D-Day, the enemy had been shelling the positions of the battalion at frequent intervals. A captured German fire control map listed two of the company CPs at their exact locations, and designated them as primary artillery targets. From positions southwest of SCHEVENHÜTTE (005420), the battalion was to attack on 16 November to seize GRESSENICH. 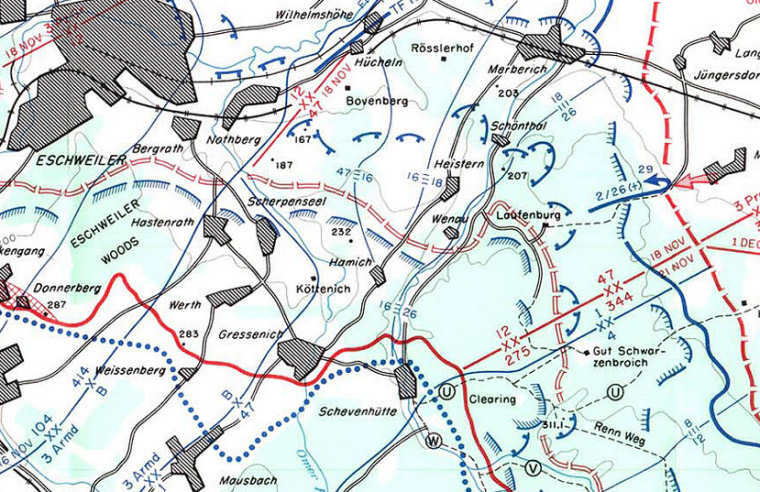 The company plan of attack was to have C Co. to take BUSCHHAUSEN (989417), and then attack GRESSENICH's northwest and west sections; A Co, was slated to clean out the eastern and northeastern portion of GRESSENICH; while B Co. was to stay in reserve on the edge of the woods overlooking GRESSENICH. Two platoons of TDs and one platoon of tanks were firing from KREWINKEL (980410) into the houses on the edge of GRESSENICH. Just before the infantry jump-off, a five-battalion TOT (Time On Target) was placed on GRESSENICH; PW information revealed that the enemy intended to defend from the houses in the town. At the same time, mortar concentrations from the 81mm and 4.2s were placed on GRESSENICH. From H-5 to H-plus-10 the artillery, mortar, and tank and TD fire continued on general areas and on a few well-known OPs within the town, such as the church steeple. Co. C on the left and Co. A on the right jumped off at 1300; Co. C took BUSCHHAUSEN without difficulty and both companies met very little fire initially. As they approached GRESSENICH, small arms and self-propelled guns firing from the town slowed the advance. A Co. received the stiffest opposition on the battalion right flank. After the companies left the woods, the ground was open and sloping downward toward GRESSENICH. Tanks of the 3d Armored Division advanced on GRESSENICH from the southwest, attacking from MAUSBACH (970418). The advance of the 3d Armored occupied the enemy and drew fire away from the 1st Bn., but after the 3d Armored had skirted the edge of GRESSENICH and proceeded to the northeast the opposition in the town started to make a determined stand. When C Co. reached the outskirts and received heavy opposition, a tank platoon from the 746th Tk. Bn. was shot down to assist C Co. The tank platoon leader got through BUSCHHAUSEN without incident, and then became engaged with some anti-tank guns in GRESSENICH. After the 4.2s had given the anti-tank guns a working over, the tank platoon leader called for the rest of his five tanks to come up; however, the first two hit riegel mines which the platoon leader's tank had failed to explode. The one tank helped the situation somewhat with supporting fire, but it could not move because it was pinned down, between BUSCHHAUSEN and GRESSENICH, by an antitank gun which it could spot but not knock out. The situation at the end of the day on 16 November was that the 1st Bn. had succeeded in penetrating the southern edge of town, and had seized several houses. Positions were consolidated for the night, and the battalion positions were harassed by artillery fire until morning. The casualties for the day's operation were 6 killed and 22 wounded; most of these were in A Co., which suffered 20 casualties-- a large proportion from small-arms fire. 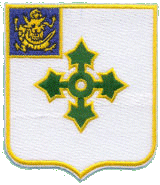 The enemy defending GRESSENICH were from the 1st Co., 48th Regt., 12th Division. Approximately 100 men were defending GRESSENICH. They were a good type of troops, better than most that the battalion had met while crossing France. 19 PWs were captured on 16 November in GRESSENICH. At 0800 on 17 November, the 1st Bn. completed the clearing of the town with companies abreast. C Co. went up the west side, A up the center and B cleaned the eastern portion. There was only scattered opposition from small-arms fire as the companies methodical mopped the buildup area. By 1030, the opposition was completed quelled, although long-range artillery fire continued to fall within the town limits all day and caused six casualties in the battalion. Patrols dispatched to contact the 16th Inf. (1st. Div.) on the right and the 33d Armored Regt. (3d Armored Division) on the left had some difficulty getting through. The first patrol to the 33d Armored Regiment tried to get through to KOTTENICH (992438), but was checked by self-propelled guns firing from the ridges running northwest and northeast out of HAMICH. A second patrol finally got through; the difficulty was that the armor had gone through the area, and there had been insufficient opportunity to clean it all out. Four PWs were bagged by the patrols of 17 November. Late in the afternoon of 18 November, the battalion received orders to move two companies to the vicinity of Hill 232 (998443), to go into an assembly area near GRESSENICH (990445), preparatory to attacking and seizing Hills&nbsp;187 (985456) and 167 (991462). Hill 232 had previously boon taken by the 16th Inf. of the 1st Division. 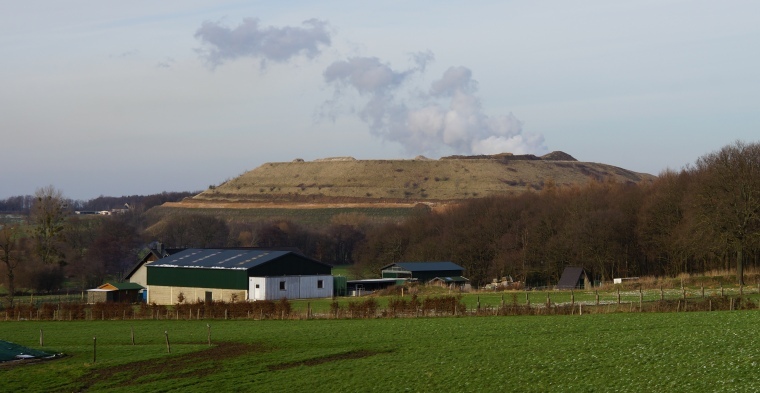 Today's view towards Hill 232, as seen from the road Gressenich - Hamich. The plan for 19 November was to have the 16th Inf. move out from Hill 232, and when they had secured their objective at (990448), the 1st Bn./47th would seize Hill 187 in a coordinated attack with the 3d Bn./47th on the right flank. This being done, the 1st Bn. was then to send one company to take Hill 167. At 1020 on 19 November, A Co. moved out, initially behind K Co. of the 3d Bn., and then up toward Hill 167. B Co. headed toward the quarry at (991449) and then toward Hill 187. A Co's chief difficulties were reaped from those of the 3d Bn., which had to cope with considerable flanking fire from the woods to the battalion's right in the area of the 16th Inf. It had been planned to wait until B Co's seizure of Hill 187 before A Co. proceeded to 167, therefore 167 was not captured on 19 November. B Co. had considerable difficulty attempting to storm Hill 187, which was strongly defended and also afforded the enemy direct observation on any troops advancing across open ground leading up to the hill. D Co. was also receiving machine gun fire along its left flank, although elements of the 104th Division were presumed to be in VOLKENRATH (977454) and BOHL (974458). Five men from B Co. reached the top of the hill, but were driven back, and B Co. took heavy casualties in attempting to subdue the enemy In his well-dugin positions. Casualties for the operations of the 1st Bn. on 19 November were 10 killed, 37 wounded and 5 missing-- most of them in B Co. For the night B Co. took up positions generally along the line (987452)-(986453)-(989451) and prepared to renew the attack the following morning. A Co. held a line generally from (995455) to (996458), and C Co. was in battalion reserve. Problems of evacuation became more acute on 20 November, as the tired medics could not handle the large number of wounded, and the cold and rain hampered evacuation efforts. The battalion A & P platoon was pressed into service and used for evacuating the wounded, after the battalion medics had worked incessantly for 24 hours. At 1015 on 20 November, B Co. resumed the attack on Hill 187 after a 15-minute artillery preparation climaxed, by two minutes of intense fire. An attempt was made to have the preparation include 155mm., but because of the proximity of elements of the 104th Division it was kept down to 105mm. Determined resistance by the enemy on Hill 187 again prevented B Co. from securing their objective on 20 November. Small arms, mortar, and observed, flat-trajectory fire from 88mm guns on the hill chocked the attack, and B Co., down to a strength of 90 riflemen at the close of the day, took up positions along the line (983456)-(988458). The plan for 21 November was to have C Co. pass through B and attack Hill 187 again, while the 3d Bn, attacked northeast through the woods toward BOVENBERG (998468). C Co. jumped off at 1000 after an artillery preparation, and advanced as far as the western edge of the objective but were stopped by the same type of resistance which B Co. had met in preceding days. The enemy artillery and mortar concentrations seemed to be getting heavier and more accurate. Roads were not only interdicted, but made impassable because of the trees which were felled all along the routes. About 1330, the battalion received a telephone call from regiment ordering C Co. to withdraw from the hill in order to allow additional artillery to be fired on the hill. C Co. withdrew about 500 yards, and then all the artillery available in the VII Corps -- 17 battalions -- fired a three minute TOT. The results were good. "It killed all the Kraut on the hill, except a few who came out screaming and moaning; they were more than tired of the war at that point," commented Col. Allgood. One-third of the TOT was delivered by 105mm, one-third by 155mm, and one-third by 8-inch and 240mm. Time, some AP, and delayed action fuzes were all fired. "It just literally made the ground bounce. Col. Clayman (Lt. Col. Donald C. Clayman, CO, 3d Bn.) got excited and asked me why they were bombing so close to his troops." Casualties for the Bn. on 21 November were one killed and 26 wounded; 25 PWs were captured. On 22 November, patrols from C and A Cos. were sent to both hills, and although the enemy sent down an artillery barrage on the C Co. patrol to Hill 187 no infantry opposition was received on either hill. Patrols captured 82 PWs. In the next few days, the 1st Bn. hold their positions and waited for the 2d Bn, to pass through. Continuous rain added to the unpleasantness, and one man died of exposure. On 24 November, the battalion moved into NOTHBERG (979462), where the battalion was attached to Task Fore Richardson of the 33d Armored Regt., 3d Armored Division. On 26 November at 1140, B Co. attacked WILHELMSHOHE (002478), and engaged in severe house-to-house fighting around this enemy strongpoint. Three men were killed and eight wounded in taking WILHELMSHOHE, and the company captured one officer and 18 men. 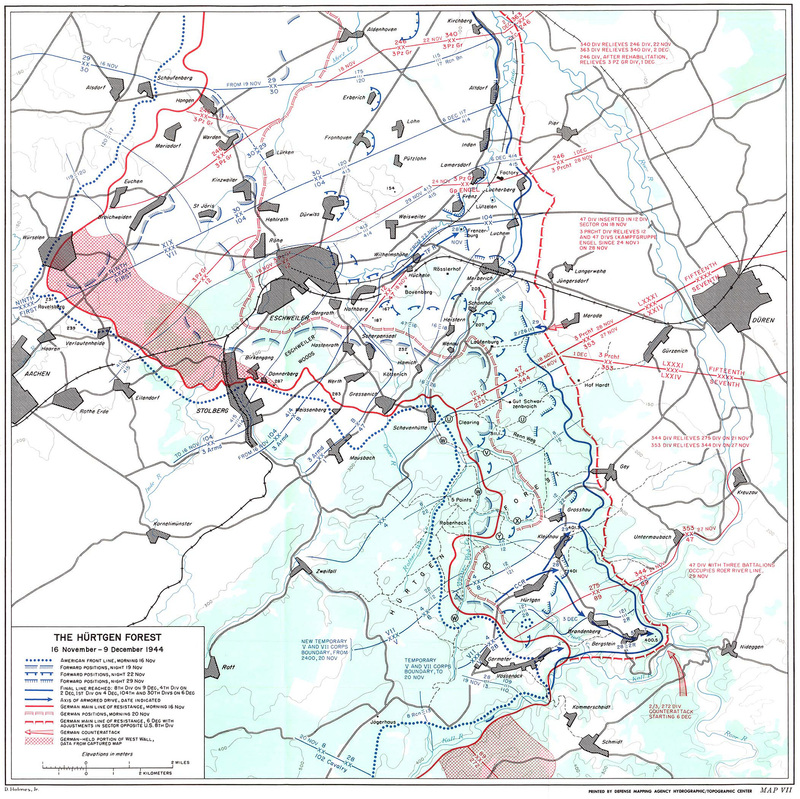 The plan then called for B Co. to continue in a generally southeasterly direction and clean out the area between the railroad and LANGERWEHE road, with particular attention to strongpoints and houses at (022478); C Co. had platoons at (013480) and (021477). In addition, an infantry-tank attack was planned with the 3d Armored Division task force to capture a small patch of woods in the vicinity of (020482). Col. Richardson and Col. Allgood decided against attacking this area with a "wide-open formation", and instead decided to infiltrate infantry slowly across the open ground to the woods. With the tanks delivering supporting fire, the infantry advanced under a smoke screen and took all assigned objectives with the loss of only 1 killed and 3 wounded. One officer and 15 man were captured by the 1st Bn. At the close of the day, B Co. was situated at (022478); C Co. had platoons at (013480), (016480), and (01954832); and A Co. was in the vicinity of (007479). This action of 26 November ended the active assignments for the 1st Bn. during the operation. After holding in position for one day, the battalion was relieved at 2100 on 28 November and withdrew to NOTHBERG. On 29 November, the battalion left for the VII Corps rest area. Col. Allgood had previously rated the HAMICH Ridge fighting of the 1st Bn. with the REMAGEN bridgehead and the advance to the St. LÔ breakthrough line as the three toughest fights which the battalion had ever experienced. After reviewing in more detail the action of the battalion during this period, Col. Allgood concluded that it was not quite as severe as the fighting at REMAGEN and up to St. LÔ. "It seemed tougher at the time," he explained, "for two reasons: first, we had not been actively committed for two months, and second, the cold, rainy weather made any kind of fighting tough."